A mother is shot and killed outside a police station in Hawthorne by a father during a custody exchange. Rick Montanez reports for NBC4 News at 11 p.m. on April 7, 2019. A man armed with a shotgun killed the mother of the couple's child during a custody exchange Sunday in front of the Hawthorne Police Department, police said. 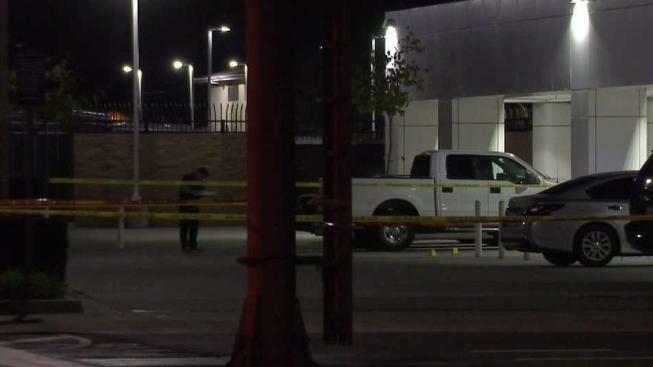 The 27-year-old mother was killed in front of her son and relatives who were present for the exchange, LA County Sheriff's Department Homicide Bureau Lt. Scott Hoglund said. The suspect was identified as Jacob Munn, of Hawthorne. Jail records indicate he's 30 years old. The shooting occurred at about 6 p.m. at the entrance to the lobby of the police station, Lt. Gary Tomatani of the HPD said. The child was already inside the police station when the mother arrived to pick up the 17-month-old. As she approached, the father fired at least one shot at her, Hoglund said. The child was not injured in the shooting, and the shotgun was recovered at the site of the shooting, Hoglund said. "In general, the police departments are not aware of any custody exchanges," said Hawthorne Police Chief Michael Ishii. "Oftentimes, (the parents) make arrangements at local police stations or across the county. It's a public space. We are not supervising them, not aware of them. "We're not sure if that was the case yesterday in this horrible and tragic incident." Upon hearing the sound of gunshots, officers ran out, Tomatani said. One of the relatives who witnessed the shooting told the officers that the man was driving away, according to a relative at the scene. The man was able to get away in his car, with police officers shooting at the vehicle, Hoglund said. A short time later, police said they located the abandoned vehicle near the intersection of 133rd Street and Hawthorne Boulevard. For several hours, police put up a containment zone where they believed the man was trapped and warned the public to stay away. At approximately 9:15 p.m., police said they had arrested the man within that containment zone. A person who identified himself as a relative of the victim said that the mother lived in Menifee and the man lived in Simi Valley. He said Hawthorne was a middle ground to exchange the 17-month-old child. The Los Angeles County Sheriff's Department took over the investigation. Earlier on Sunday, another shooting in Hawthorne resulted in an officer being struck by gunfire and wounded.